How best to maximize a large downtown infill lot while contributing a contemporary sense of permanence and vitality to the urban realm? The design of this speculative development responds to the context of a vibrant downtown neighborhood with a high-rise building that nestles into the large infill lot with a strong presence. 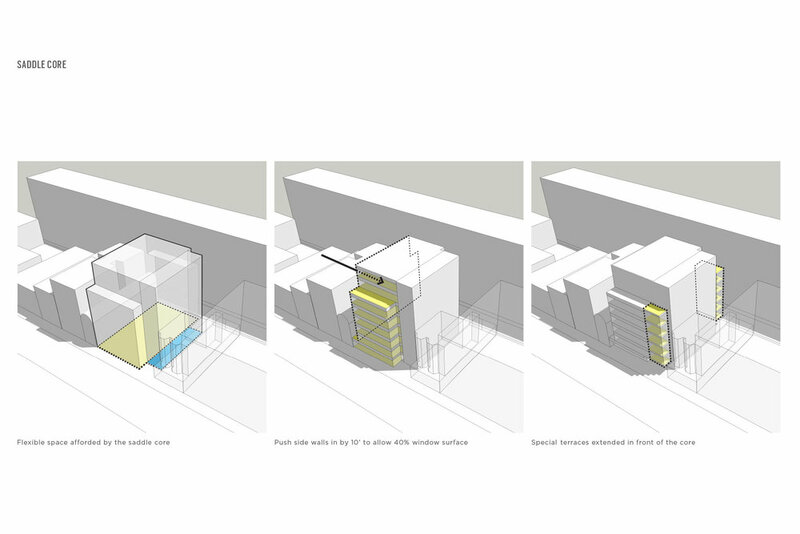 Our charge was to design a building that complied with allowable zoning regulations and maximized value for the site. We explored a mix of various uses that would combine to shape the building’s form, activate the street and result in a dynamic structure that would recall the past with a contemporary sense of permanence. The building design responds to the context with significant retail and commercial opportunities on the first two levels which are pulled in from the property line to create a double height arcade along the street. The remaining upper levels of the building provide a boutique hotel with a sky-lobby, indoor amenity spaces, and various outdoor terraces. The modularity of the façade expresses the cellular nature of the stacked hotel rooms and is carried out down to the articulation of bricks. • Thin composite steel-concrete floor system to achieve shallow floor-to-floor heights.